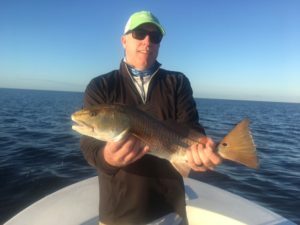 One of the best months of the year traditionally, this October did not disappoint. 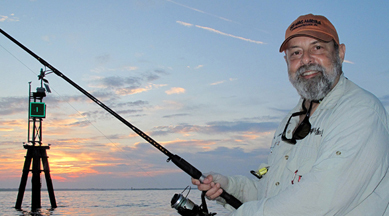 Water temperatures cooled throughout the month, ending with a chill near the end of the month. 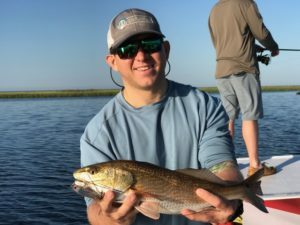 While there were plenty of fish around, they tended to be scattered and there were days when filling trout limits was difficult. 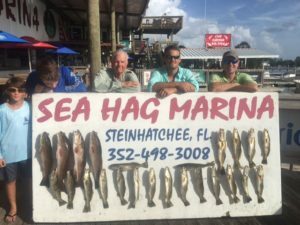 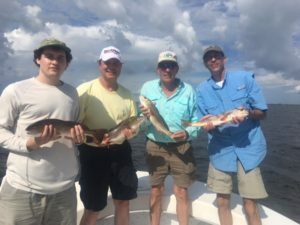 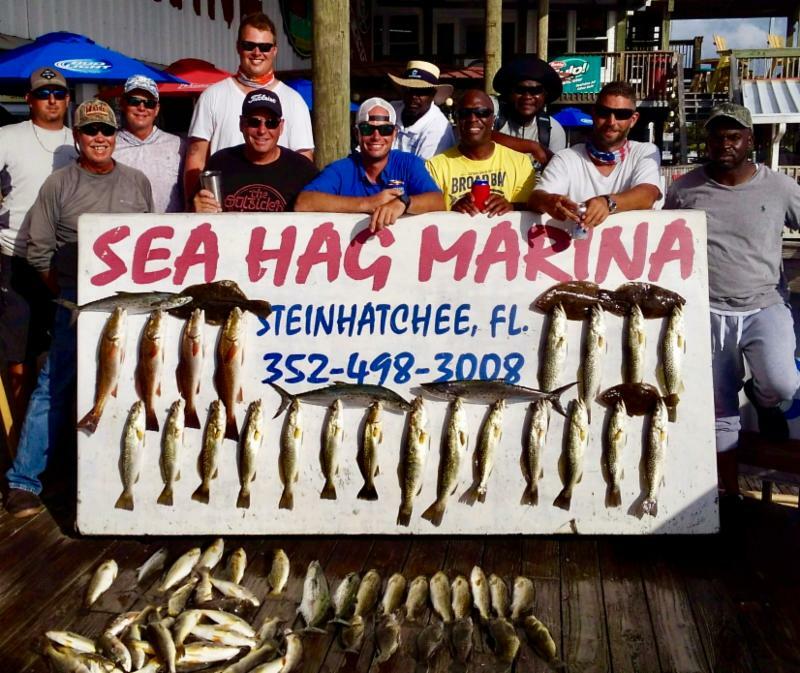 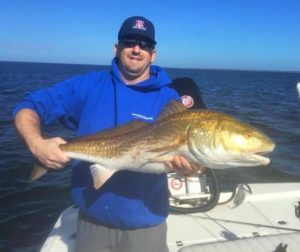 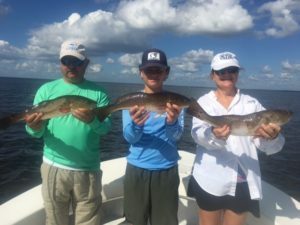 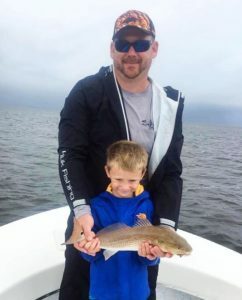 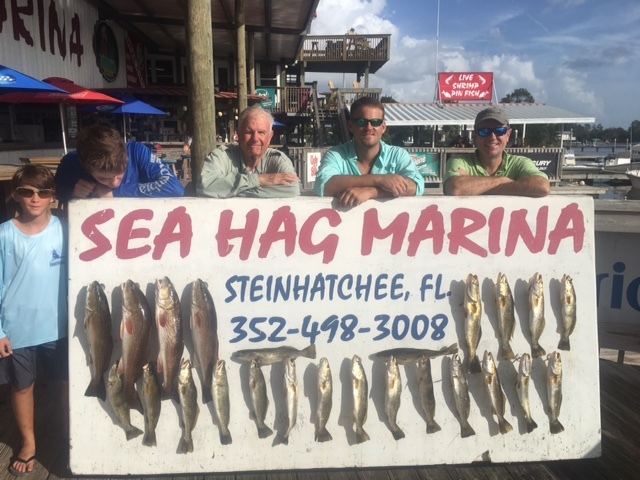 Redfish were schooling nearshore, and there were some excellent fish taken, including many overslot fish. There were some windy days but the bite remained strong. 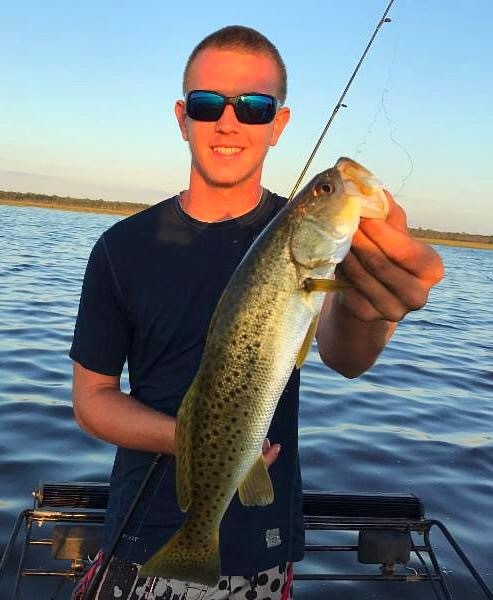 Late in the month the silver trout showed up, making for some hot action on light tackle. 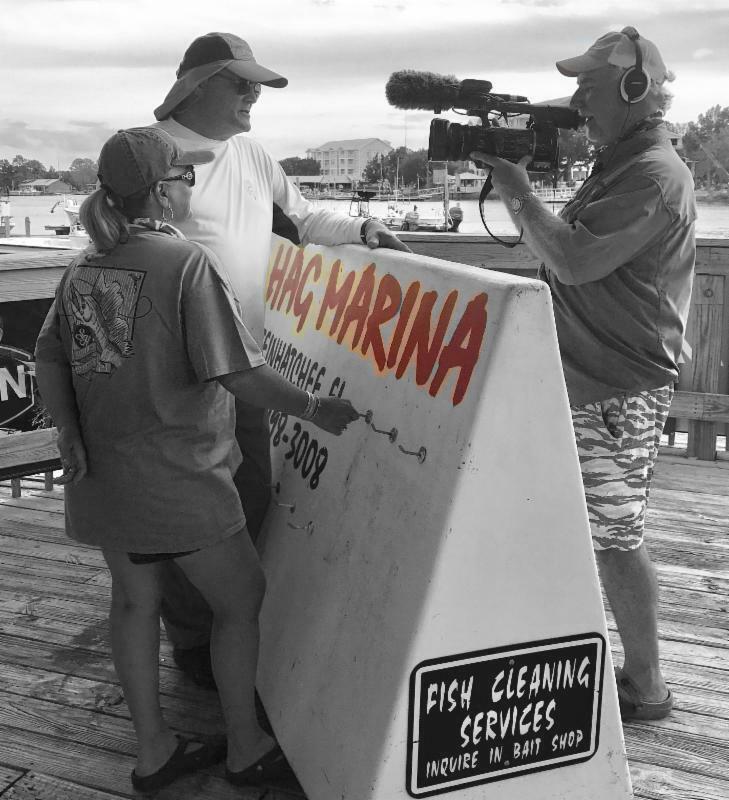 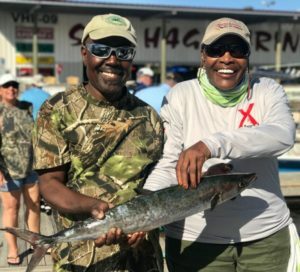 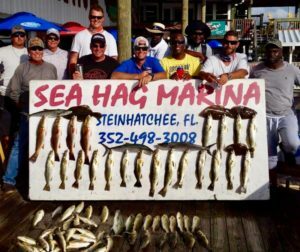 Large numbers of Spanish mackerel and some hard-hitting bluefish added to the action. 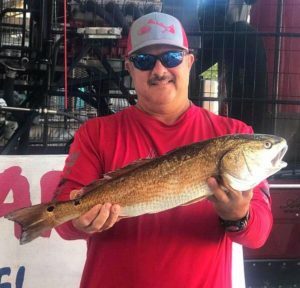 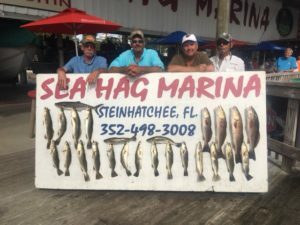 Rick Pena of Rick’s Rods took first place redfish in the Santa Fe Raiders tournament. Robin Phillips from High Springs scored the big trout in the same tournament. 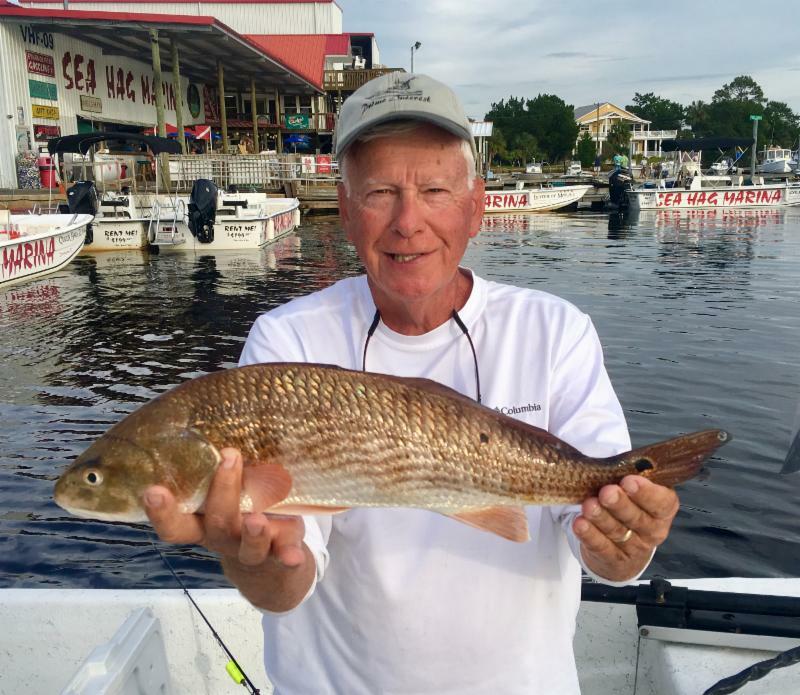 Bob Smith from Dunnellon with a nice overslot redfish. 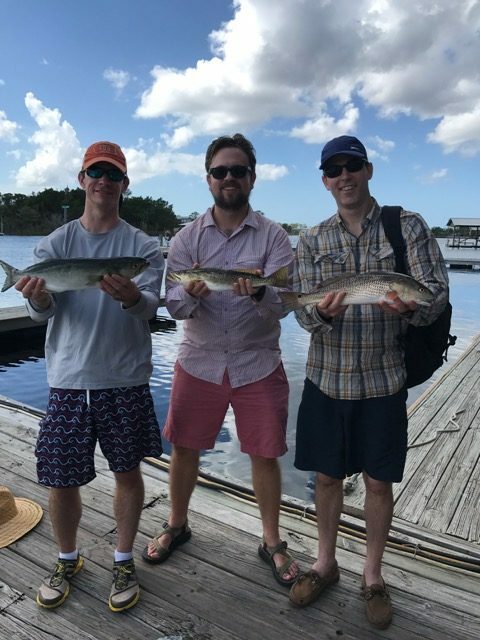 Advanced Furniture booked three captains and caught a whole bunch of fish. 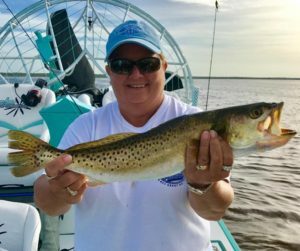 Cindy Graham from Valdosta with her upper slot trout. 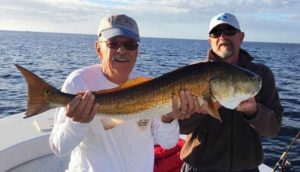 Danny and dad Dan Garelick with a fine redfish. 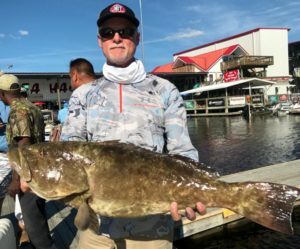 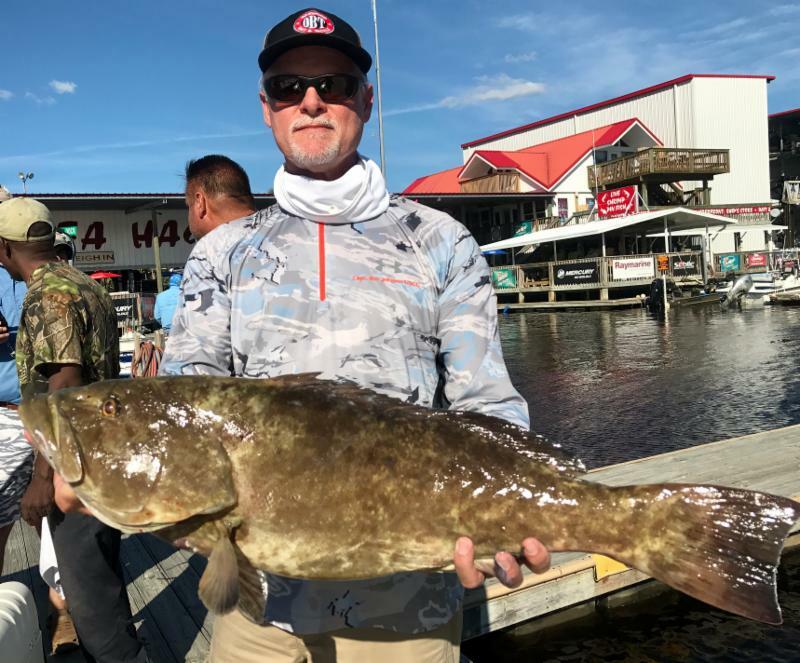 Ron Johnson went offshore during the Fish ‘n Fest and came back with this fine grouper. Geraldine Davis from Ringgold with a young kingfish. 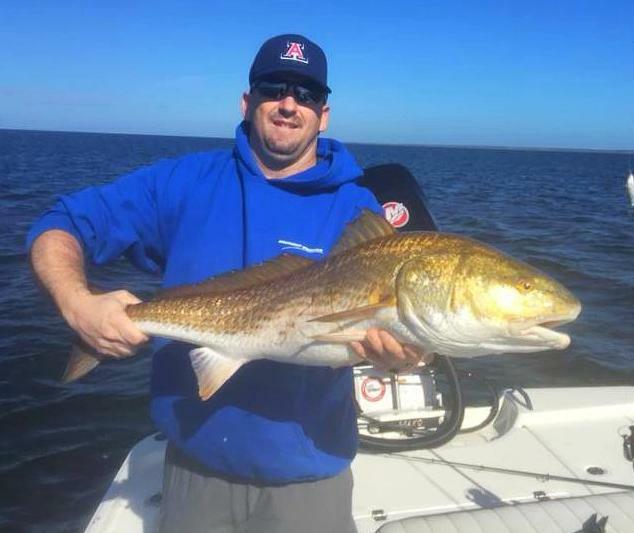 William Huff from Jacksonville with a giant redfish. 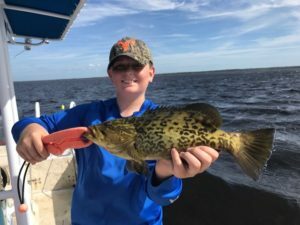 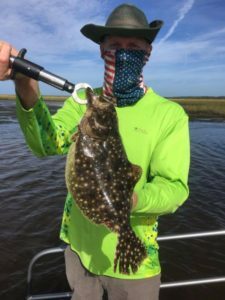 Matt Burke with some great eating…a good-sized flounder. Regardless of his name, James Troutman from Nag’s Head NC was pleased to settle for this redfish. Shan Roper from Steinhatchee found this shoreline redfish. 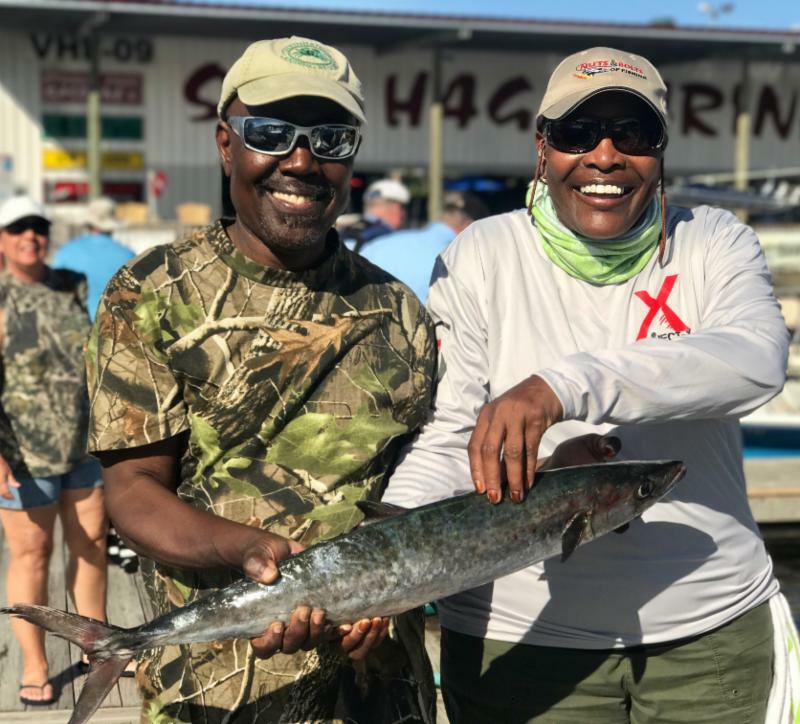 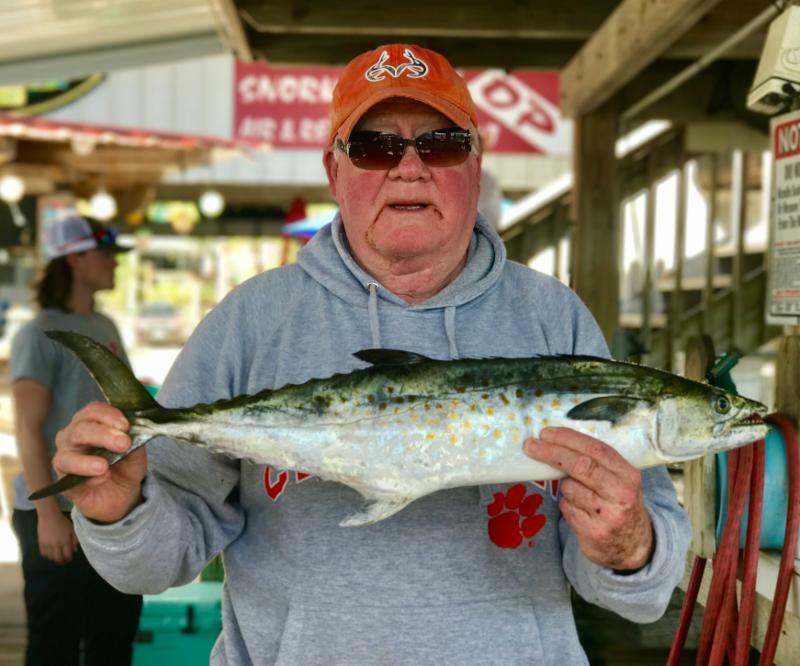 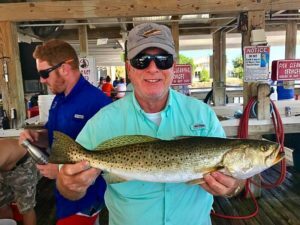 Charles Lever from Birmingham with this Spanish mackerel which weighed just under 5 pounds. 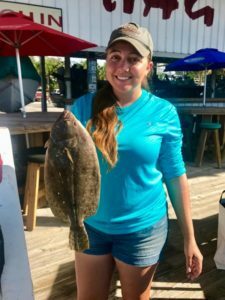 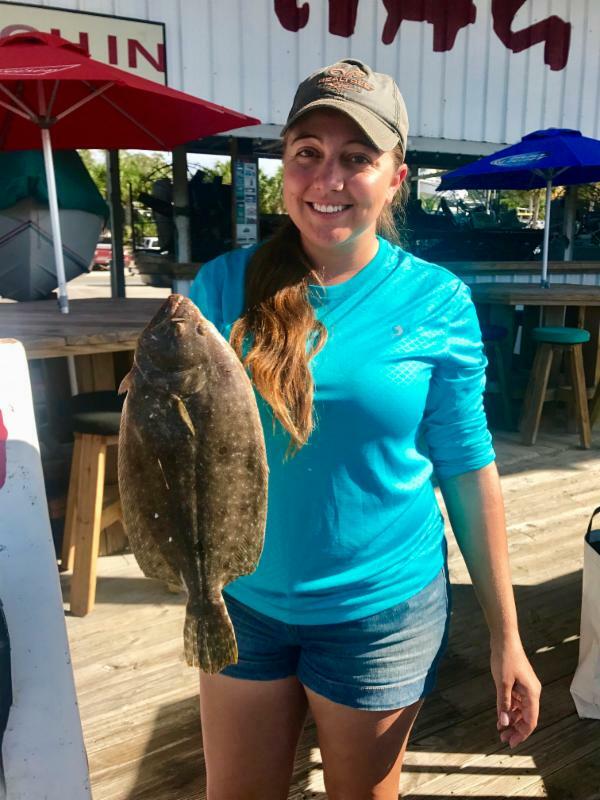 Amber Carter from Gainesville with another excellent flounder. 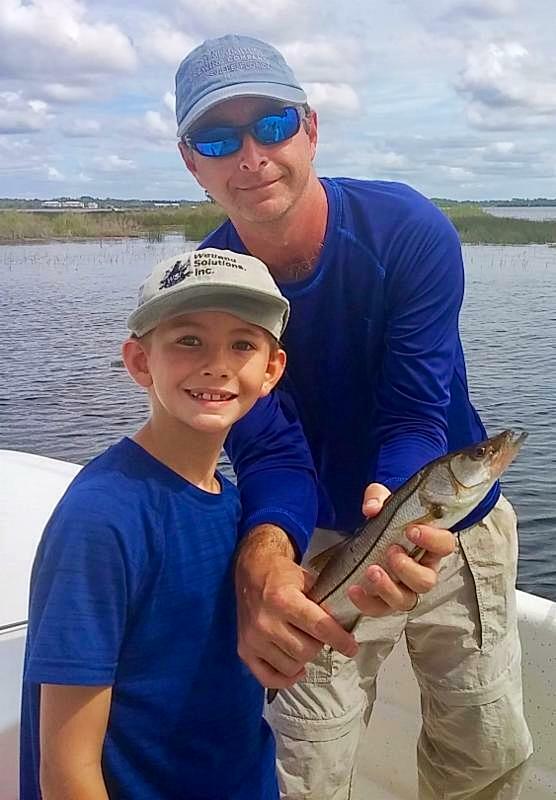 Chris and Colton Keller with a rarity…a small snook caught near the river. Tom Sayer with a fine gator trout. 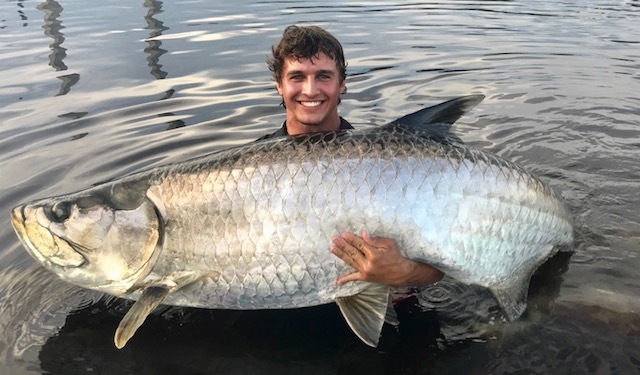 Yes, there are tarpon in the Steinhatchee River. 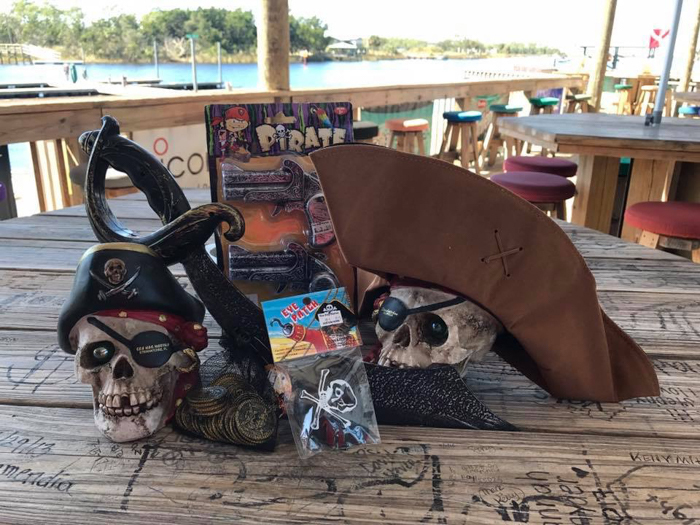 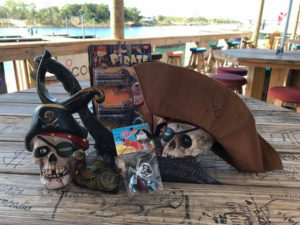 Ask Sea Hag’s Brett Molzen and maybe he’ll give you some hints. 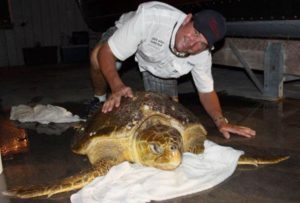 Thanks to Sea Hag Admiral Charlie Norwood, Chase Norwood and Brett Molzen, this loggerhead turtle nicknamed Barnacle Barbie was rescued and is currently recuperating. The weather is starting to cool down and drive the fish in to their cooler weather patterns. 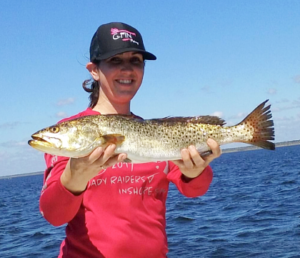 This time of year is a very family friendly time of year with a cool climate and active fish. 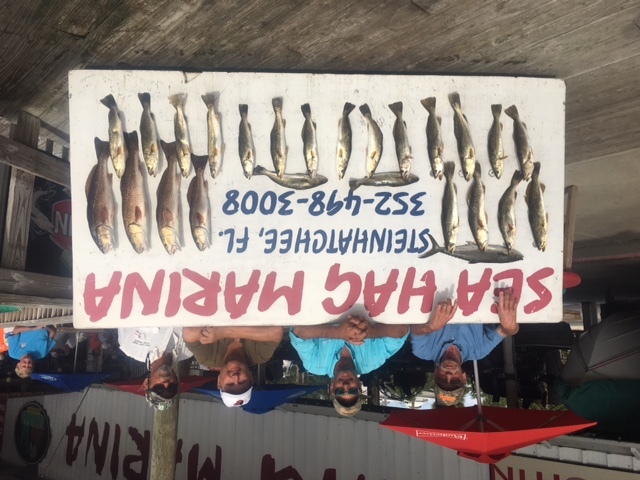 I have days available all throughout the near future and would love the opportunity to show you what the flats of Steinhatchee have to offer in the fall.